Women Who Write will lead a session on “scene development” after the festival 1:30 – 2:15 with Cheri Powell. For more information, contact UofL Women’s Center, womenctr@louisville.edu or 502-852-8976. Kentucky Women’s Book Festival – Saturday, March 2, 2019 at the University of Louisville. WWW is a sponsor of the Kentucky Women’s Book Festival which brings noted writers to a morning of workshops and readings. It was founded by Carridder Jones, who was also the founder of Women Who Write. The 13th annual Kentucky Women’s Book Festival featuring authors from a wide variety of genres, will be held on Saturday, March 2, 2019 from 9am – 2:30pm, at the Brandeis School of Law on University of Louisville’s Belknap Campus. Hannah Drake, Emily Bingham, Annette Allen, Julia Royston, Atalya Lawler and Mehwish Zaminkham of the Louisville Story Program, Julie Wade and Flora Schildknecht will present. Women Who Write member Cheri Powell will lead an after lunch workshop on “Scene Development” from 1:30 to 2:15. 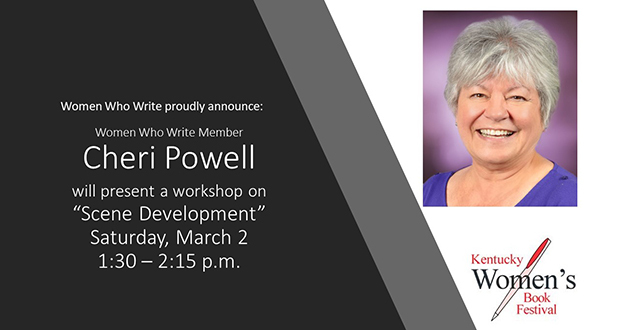 Women Who Write member Cheri Powell will present “Scene Development,” a workshop that will take a look at what constitutes a well-written scene. Participants will delve into scene structure and learn how to use a tool to analyze existing scenes. The same tool can be used to plan scenes and maximize your writing effort. The session will be held Saturday, March 2nd from 1:30-2:15 p.m. at the Brandeis School of Law on University of Louisville’s Belknap Campus immediately following the 13th Kentucky Women’s Book Festival. Cheri Powell received her undergraduate degree in marketing from the University of Louisville and her MBA from Thunderbird School of Global Management. She has successfully marketed her book Seven Tips to Make the Most of the Camino de Santiago to a worldwide market. She gives classes and webinars on marketing to help others do the same. To contact Cheri, email her at writing_cheri@yahoo.com.